It's that time of the year again and I am starting to crochet gift items. 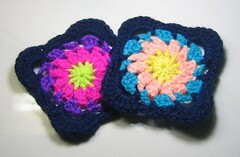 These are a pair of granny squares...I am making a hat for my friend. The pattern is from "Simply Creative Crochet" (Premier Issue 2003 - Better Homes and Gardens). There are many projects in the magazine that crocheters will love, like pullovers, a couple of toys, bags, scarf, skirt, hats, etc. When I finish the hat, I will post a photo. I really like hat patterns. I think my favorite to crochet are hats, and I am lucky to have a friend who loves hats.